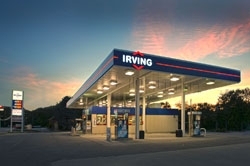 With almost 90 years of experience serving Eastern Canada and the Northeastern U.S., Irving is proud to be a leader in the regional fuel market while bringing a commitment to fair business practices and competitive prices to its customers. Irving Oil is a family-owned, privately held energy processing company with corporate headquarters in Saint John, New Brunswick, Canada and an office in Portsmouth, New Hampshire in the United States. Irving has also paved a unique business presence by focusing on the creation of clean fuels: they were the first company to receive the EPA's Clean Air Excellence Award for removing 90% of the sulfur from their gasoline. Irving holds itself to a high standard of corporate responsibility, as demonstrated by its dedication to practice safe, sustainable business and to give back to the community, specifically in the areas of education, environment, and healthcare. This commitment to the humanitarian aspect of having a strong presence in the industry coupled with producing a highly reliable product makes Irving a recognized business partner for both their customers and fuel dealers. If you already sell Irving Oil or will become a dealer soon, contact us at D&C Transportation and find out how we can meet your bulk fuel needs in a timely, cost-efficient manner. Source for information about Irving Oil: www.theirving.com and www.irvingoil.com and various pages within those sites.